This is Adi from the Israeli Society for the Abolition of Vivisection, one of the animal rights groups involved in the campaign to shut down Mazor Farm. I'm glad to let you know that thanks to all the support and public pressure, the shipment of the monkeys to SNBL was denied! After this huge victory we are now in the struggle of banning entirely the export from Israel of monkeys for vivisection, a step that could very well lead to the shutting of the farm - as almost 100% of their clients are abroad. 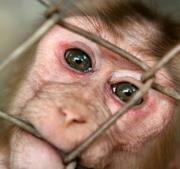 The fate of 1500 monkeys held captive in Mazor farm is in a critical phase. Please see the call for action below, to learn how you can take active part in shutting this hell. As instructed by the Attorney General, these days the minister of environmental protection Gilad Erdan is conducting a hearing to all those related to the farm, concerning the implementation of a new policy he initiated that will stop the trading from Israel of monkeys for experimentation. Unfortunately, most of the authorities that are related to the farm (directly or indirectly) are opposing to this new policy - the academy, the ministry of health, ministry of science, ministry of trade, the farm owners (of course) and others. In front of them, there is only you and us! We have submitted the minister with our position comprehensive paper that prove beyond doubt that the existence of Mazor farm is not only immoral and cruel, but also contradicting with Israel's current wild animals regulation and treaties. Now it is your turn to raise the voice of the public, the monkeys, justice and compassion. I was horrified to learn that primates are being used in experiements. Please do NOT to approve sending the animals to SNBL (Shin Nippon Biomedical Laboratories). I often wonder, if mankind would experiment on animals (and in particular) primates, if they could talk. Probably not. Just because we can't communicate with them, doesn't give us the right to experiment on them. They feel the same amount of pain, fear and terror as humans, except they can't tell us. Please do not faciliate this vile trade.